Fenor Bog in Co. Waterford is a fen located at the base of Ballyscanlon Hill. How to get there: Fenor Bog in Co. Waterford is located 16 km south-southwest of Waterford City in the village of Fenor. It is just 5 km west of the holiday resort of Tramore on the Dungarvan Road. Location map of Fenor Bog National Nature Reserve (outlined in red) near Tramore in Co. Waterford. Further detail on the Google map below. Fenor Bog is an alkaline fen located beside the Church in the tiny village of Fenor in Co. Waterford. 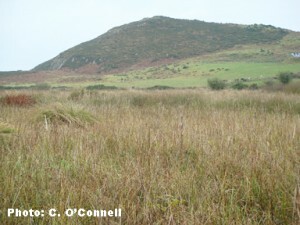 The bog lies in a depression overlooked by Ballyscanlon Hill which rises to an elevation of 148m. The bog is a storehouse of natural variety with wet woodland dominated by willow and alder, undulating greater tussock sedge vegetation and flat wet wild flower areas. Over 200 species of plant, bird, insect and animal have been recorded on the site. Fenor bog is located within the Copper Coast Geopark. The Irish Peatland Conservation Council, in association with the Móin Fhionnúrach Development Association purchased 32 acres (13ha) of Fenor Bog, near Tramore in Co Waterford in June 1999. The funds to purchase the bog were kindly donated by many Friends of the Bog and local supporters. Their help made the purchase possible. Fenor Bog is a fen habitat. Fen habitats are the most threatened peatland types in Ireland. Over 78% of fens in Ireland have been drained and reclaimed for agriculture. More recently fens are being used as illegal dumping grounds. In the county of Waterford in south east Ireland, because of their proximity to the city of Waterford they are being absorbed into ring roads and industrial estate developments. Fenor Bog is the only fen in the county of Waterford that is protected mainly because it is in private ownership and the owners are very vigilant about caring for it. Fenor Bog is a National Nature Reserve (S.I. No. 86 of 2004), a Natural Heritage Area No. 1697 and a European Geopark. It is an alkaline fen habitat with priority protection under the European Union Habitats Directive and the Convention on Biological Diversity which seeks to halt the loss of biodiversity in Ireland by 2010. It is the only peatland habitat protected in the county of Waterford, where 92% of the peatlands have already been driven to extinction and where freshwater habitats are uncommon today. Fenor Bog is a naturally regenerating fen habitat, extremely rare nationally and internationally, supported by plentiful, unpolluted groundwater and air. It has a rich biodiversity with over 225 plants and animals and is a refuge for some of the only occurrences of plant and animal species that are found no where else in the county of Waterford. It has been described as the best dragonfly site in Waterford. A great way to appreciate the very best Fenor Bog has to offer is to walk the 500m boardwalk which tracks through the variety of the habitats present on the fen and allows you to discover its wildlife secrets. 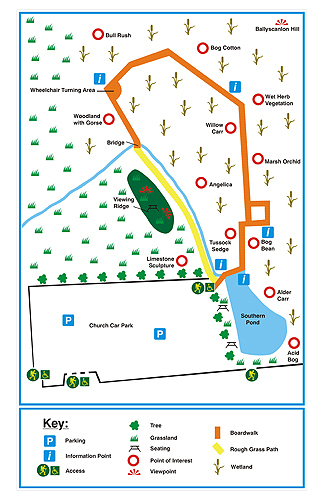 Use the map opposite to help you identify the features and wildlife. To enhance and maintain Fenor Bog so that it is a fully functioning, self regulating fen ecosystem. To maintain the use of Fenor Bog as an educational/tourism attraction, without detrimental effect on the ecology or hydrology of the bog. To ensure the boundaries of Fenor Bog are visible to the farming community and the public. To prevent harmful human affects to Fenor Bog. To increase health and safety awareness for visitors to Fenor Bog. To monitor Fenor Bog to ensure the effectiveness of the Conservation Plan. To encourage further research on Fenor Bog and to maintain an archive of research findings. 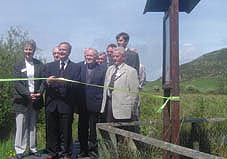 Fenor Bog was declared a National Nature Reserve by Mr Martin Cullen T. D., Minister for the Environment on the 28th May 2004. The Minister praised the “dedication and commitment (of all involved) in the preservation of our natural heritage, handed down to us by generations past for us to pass onto those who have yet to come”. Not only were IPCC and MFDA-owned lands included in the reserve order but two families – the Curran’s and the Queally’s included a buffer zone of their lands surrounding the bog as part of the nature reserve. IPCC’s Director Martin Kelly who attended the launch paid tribute to these families for their action. At the launch of Fenor Bog Nature Reserve were Rita Byrne, Pat Greene, Martin Cullen T.D., Fr Purcell, Dan Cowman, Stan Flynn, Martin Kelly and Jimmy O’Sullivan. Photo: P. Crushell. Father Purcell of Fenor Village Church gave this blessing on the occasion of the announcement of Fenor Bog as a Nature Reserve. “God, Creator of our world, we thank you for the beauty of creation. May we respect our world, our environment, and preserve it well for future generations. May the beauty of this Bog of Fenor be an inspiration to us. May it be a centre and source of wonder and reflection. Through the beauty and mystery of Nature may we be drawn towards you in thanksgiving and admiration. May people who visit this beautiful place be refreshed and encouraged on their journey through life.” Amen. Five members of the Dutch Foundation for the Conservation of Irish Bogs visited Fenor Village in Co. Waterford in July and presented the Móin Fhionnúrach Development Association community group there with an international award in recognition of their role in conserving Fenor Bog. 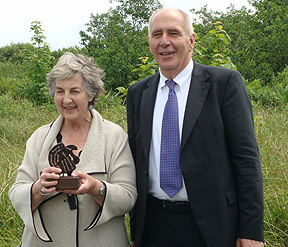 The Award was presented to Rita Byrne of the MFDA by Prof. Matthijs Schouten, the founder of the Dutch Foundation, who is also known as “the father of bog conservation in Ireland”. It consisted of a bronze sculpture showing bog cotton and a bog landscape. In addition to the sculpture the Dutch Foundation presented the group with a conservation grant towards the on-going research work being undertaken on Fenor Bog. Te work of the MFDA was brought to the attention of the Dutch Foundation by the Irish Peatland Conservation Council, who have been closely involved with the community group in conserving beautiful Fenor Bog. The MFDA Community Group is only the third group in Ireland to receive the honour of this award. They follow in the footsteps of others who were involved in saving Sharavogue Bog in Co. Offaly and Mullach Mór in the Burren of Co. Clare. 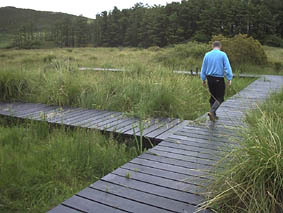 A boardwalk constructed by the MFDA at Fenor Bog between 2001 and 2004 makes for a wonderful visitor experience at this unique site. The boardwalk is made from 100% recycled plastic lumbar and is 500 m long. The creation and management of the Fenor Bog NNR by the IPCC and the MFDA is supported by the following: IPCC’s Friends of the Bog, the Community of Fenor, Waterford County Council, The Biodiversity Fund of the Heritage Council, Ford Conservation Award, Praeger Fund of the Royal Irish Academy, the Irish Habitat Stamp Conservation Programme, Ireland Fund, Waterford Leader and the Irish Peatland Conservation Council.